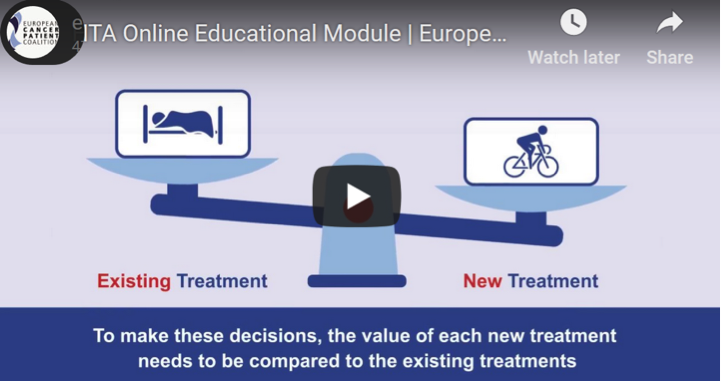 That is the question the European Cancer Patient Coalition is trying to answer, for non-experts, with their new “online education module” on Health Technology Assessment launched in February. While the tool is primarily focusing on cancer, it is very relevant for neurology patients as well! Aimed at patients and advocates, the module explains why, how and where cancer patients and patient organisations can get involved in this decision-making process. In light of on-going political debate on future European cooperation on this topic, the module will empower all patient organisations to become stronger advocates at national level. It comprises of slides that walk people through Assessment process, answer questions like, “Why do some countries reimburse a cancer treatment and others do not?” There’s also a call to action urging patients to get involved — an effort that’s especially salient after the Parliament essentially stripped patients from the formal European-level Health Technology Assessment process in its amendments to the Commission’s proposal. While the tool is primarily focusing on cancer, it is very relevant for neurology patients as well!